Meer Babar Ali Anees a renowned Urdu poet and famous Marsia writer was born in 1801 in Faizabad (the then capital of Awadh), Uttar Pradesh. 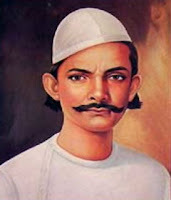 His grandfather ‘Meer Hasan’ was a famous poet, known for his lyrical composition of a Masnavi titled ‘Sahar-ul-Bayan’. His father ‘Meer Khaleeq’, who restricted himself to the composition of Marsia was also acclaimed for his work. His father, Meer Khaliq being a poet and litterateur himself, took personal interest in the education and upbringing of his son, and entrusted him to the care of reputed contemporary teachers, ‘Meer Najaf Ali Faizabadi’ and ‘Maulvi Hyder Ali Lucknavi’. In addition, Anees's mother who was an educated and pious lady played a significant role in shaping the personality of the boy poet. But above all, it was the boy's own instinctive urge for learning and literature that made him an accomplished poet, proficient in Arabic, Persian and Islamic scriptures, and well-versed in logic, literature and philosophy. Anees had started writing poetry quite early in his life right at Faizabad, though he perfected his art in Lucknow under the supervision of ‘Imam Baksh Nasikh’. In keeping with the popular trend, he first tried ghazal composition and adopted his Takhallus (Pen Name) as ‘Hazeen’. He once went to a mushairah, and recited a ghazal, which was praised. His father, hearing of this, was extremely happy at heart. He called his promising son, heard the ghazal and advised him to follow him and restrict himself to the composition of marsia which being a service to their faith was considered to be nobler. From that very day, the obedient son turned his back on it. Ustad ‘Nasikh’, a celebrated poet attached to the Court, suggested that the budding poet change his pseudonym from ‘Hazeen’ to ‘Anees’. Thereafter, with Nasikh's blessing, it was laurels all the way for Anees as a ‘Marsia-Go’. Giving up worldly affairs, he entered the circle of faith and devoted his whole life to it. The blessings that flowed from his good intentions gave him the faith and the world too, in this activity. He composed salaāms, elegies, nauhas, and quatrains. The length of an elegy was from thirty-five or forty to fifty stanzas. The ‘Marsia’, is an elegiac poem written to commemorate the martyrdom and valour of Hazrat Imam Husain and his comrades of the Battle of Karbala. In its form the marsia generally consists of six-line units, with a rhyming quatrain, and a couplet on a different rhyme. This form found a specially congenial soil in Lucknow mainly because it was the centre of Shia Muslim community, which regarded it an act of piety and religious duty to eulogise and bemoan the martyrs of the battle of Karbala. The sub-parts of marsia are called noha and soz which means lamentation and burning of (heart) respectively.It is usually a poem of mourning. Meer Zameer and Meer Khaleeq on the bedstead of old age, promoted Meer Anees to the pulpit in his father's place. On the other side, ‘Mirza Dabeer’ advanced to confront him. He was not a poet by family background, but was the devoted pupil of Meer Zameer. When both young men began to gallop into the fields of majlises, then the clouds of progress in that art rose up thundering and growling, and a torrent of new inventions and devices began to rain down. The true-believing appreciators of the young Anees and Dabeer’s accomplishment were greater in numbers, and much greater in importance, than those their elders had found. Their poetry earned such esteem that not only was the esteem confined merely to oral praise and honor and veneration but valuable rewards of money and goods were presented to them in the form of gifts and offerings. Both accomplished ones showed that they were both real and proven poets, and ones who could, with the power of their arrangement of words, use every sort of theme, every type of idea, every situation, to weave such an enchantment that they could if they wished make people weep, make them laugh, make them sit petrified with astonishment. With both ustads, two groups of partisans formed. One was called the Anisians, the other the Dabirians. Although their pointless prides and objections created inappropriate disputes and quarrels, the good outweighed the harm. When both factions presented their arguments, some were heavier in weight, some larger in size. Thus a decision in favor of either side was impossible. The Anisians looked for equals of their poetry-creator by demanding his limpidity of speech, beauty of description, and pleasure of idiom. The Dabirians presented in opposition grandeur of words, high flight, and newness of themes. Mir Anees has shifted along with his father to Lucknow in 1842. The family initially settled down at Shaidon ka Ahata. Anees built an Imambara over the grave of his father Mir Khaleeq, near his residence when he died in 1844. The residence and imambara were demolished by the British, when the movement of 1857 began, when nearly two thirds of the Nawabi buildings were blown off. During this period the life at Lucknow became badly disrupted. Looking to the threats and to save himself and his family Mir Anees with all of his family members shifted to Malihabad. Arrangements were made by Faqeer Mohd.Khan ‘Goya’ in the orchards by putting camps there for Mir Anees and his family. Faqir Mohd showed the true hospitality which was expected from that time of culture. When the atmosphere of Lucknow became normal, Meer Anees returned back to Lucknow. For some time he stayed in Mansoor Nagar in the home of his student Mirza Ahmed Abbas. Mir Anees also lived in the Raja Ka Bazaar area in Munshi Sirajuddin's house as a tenant. In 1862 Mir Anees purchased a home in ‘Chaubdari Mohalla’, Sabzi Mandi (Chowk area of old Lucknow). He lived there for the rest of his life. As long as Lucknow remained normal, Aees never went out of Lucknow. When going to some other city was mentioned to him, Anees said, 'Only the people of this city can understand this poetry. What will anyone else know of its worth? And how will he understand the subtlety of our language? It was only after the sack of Lucknow and when the last King of Awadh, ‘Wajid Ali Shah’ was deposed (and left for Calcutta) that Mir Anees accepted royal patronage and offers from other states to go beyond the limits of Lucknow to recite his marsia. He went to Azeemabad (Patna) first in 1859 and then in 1860, at the invitation and insistence of ‘Nawab Qasim Ali Khan’ and also stayed at Banaras. In 1871, at the instigation of ‘Maulvī Sayyid Sharif Husain Khan’ in Hyderabad (Deccan), ‘Nawab Tahavvur Jang Bahadur’ invited Meer Anees to Hyderabad. The people of Hyderabad showed for his accomplishment the esteem that they ought to have shown. People came in such numbers to the majlises that even the splendid mansion could not provide enough space. They posted watchmen at the doors, and told them to allow no one in except substantial and poetry-knowing people, and to permit a nobleman to bring no more than two companions. Despite this, people came in such numbers that they considered it great good fortune if they were able to find standing room, and they were happy to be able at least to hear. Paimana Bhar Chuka Hai Chhalakne Ki Der Hai." Atlast that evil time came on 10 December 1874 AD (29th Shawwal 1291 Hijri). Mir Anees died leaving his family and friends crying and screaming after him. As soon as the news spread of Anees's death in the city his fan following which icluded the Islamic scholars, Hakeems, Poets and all the famous personalities started gathering in his house. His body was taken to ‘Imambara Ghufran Maab’ and buried at the ‘Maqbara-e-Anees’. The cemetery of Mir Anees is famous as “Mir Anees Ki Baghiya". The locality in Chowk, having his house and the nearby maqbara (built over the tomb of Mir Anees, on his birth centenary around 1991-92) is named as Koocha-e-Mir Anees, in honour of the poet. Mir Anees composed salaams, elegies, nauhas, and quatrains. While the length of elegy initially had no more than forty or fifty stanzas, it now was beyond one hundred fifty or even longer than two hundred stanzas or bunds, as each unit of marsia in musaddas format. According to Muhammad Hussain Azad "The late Meer Sahib must certainly have composed at least ten thousand of elegies, and salaams beyond count. He composed as easily and casually as he spoke. Muharram and Meer Anees have become synonymous among Urdu lovers of the Indo-Pak subcontinent. Meer Anees has been a great teacher and inspiration for generations. Undoubtedly, Urdu derives much of its strength from the Marsias of Meer Anees. Meer Anees has drawn upon the vocabulary of Arabic, Persian, Urdu, Hindi, Awadhi in such a good measure that he symbolizes the full spectrum of the cultural mosaic that Urdu has come to be. No Urdu poet from ‘Ghalib’ onwards has lagged behind in showering his eulogies on Mir Anees. Besides being a master of the marsia, Anees was also a specialist of the Rubai, the shortest complete poem in Urdu, containing only four lines. Mir Anees had an extraordinary capability for the writing of rubais. He immeasurably enriched the contents of the rubai, making it much more colorful and multi-dimensional. Anees introduced the tragic events of “Karbala” and their moralistic effect to rubai. Thus, he widened the scope of rubai to unfathomable limits. The inclusion of Karbala resulted in the florescence of the Urdu Rubai. Thus, many internal and external aspects of our life found their echo in the Urdu Rubai. Along with the adoration of Ahle-Bait (The Progeny of the Holy Prophet) and lamentation for the cruel treatment meted out to them, a variety of new topics such as fortitude and forbearance, resoluteness and determination, love and amity, fidelity and faithfulness, service and sacrifice, righteousness and truthfulness, submissiveness and humility, self-effacement and selfishness, perseverance and purposefulness, and many themes of kindred nature cropped up. These virtues got a place in the spectrum of rubai. The contrasting vices such as selfishness, lust for power and pelf, lust for passion, cowardice, hard-heartedness, infidelity, atheism, agnosticism etc were condemned. Rubai, like marsia, was further enriched with the inclusion of these vices. Thus for Mir Anees, rubai was not an exercise of imagination. It was a purposeful and effective medium for upholding and promoting the moral values of life. "Perhaps there is no other poet in the world who has looked after the aesthetic and spiritual satisfaction of his fans so completely as Mir Anees does. It is simply miraculous! The first major and still current critical articulation about Mir Anees was ‘Mu’azna-e-Anees-o-Dabir’ (1907) written by Shibli Nomani in which he said "The poetic qualities and merits of Anees are not matched by any other poet". It is a fact that many compilations of the rubaiyat of Mir Anees have appeared, but the most voluminous and qualitative is the compilation of ‘Syed Mohammed Abbas’. The Book is titled “Rubaiyat-e-Anees”. In recent years, other selections of the works including the rubais of Mir Anees have also seen the light of the day. Out of these selections the valuable ones are ‘Hakim Amjad Ali Ashari’s’, “Hayat-e-Anees”, ‘Prof. Masood Husain Rizvi Adib’s’, “Rooh-e-Anees” and ‘Ehsanullah Abbasi’s’, “Nishtar-e-Sukhan”. The Majlis of 25th Rajab, in Lucknow is historically important Majlis of Marsiya. Meer Anees used to recite Marsiya in this majlis. After Meer Anees, well known marsiya writers of Mir Anees's family as Dulha Sahab 'Urooj', Mustafa Mirza alias Pyare Sahab 'Rasheed', Ali Nawab ‘Qadeem’ and Syed Sajjad Hussain 'Shadeed', inherited the legacy of reciting marsiya. Presently, Dr. Syed Ali Imam Zaidi ‘Gauhar’ Lucknavi (grandson of 'Shadeed') recites self composed Marsiya.